When I was a kid, I remember record players and vinyl still being around. But they were quickly replaced by cassette tapes and CDs later. But now records are making a comeback over the past few years. I don’t know if it’s the technology of record players getting better or hipsters longing for that classic record sound. 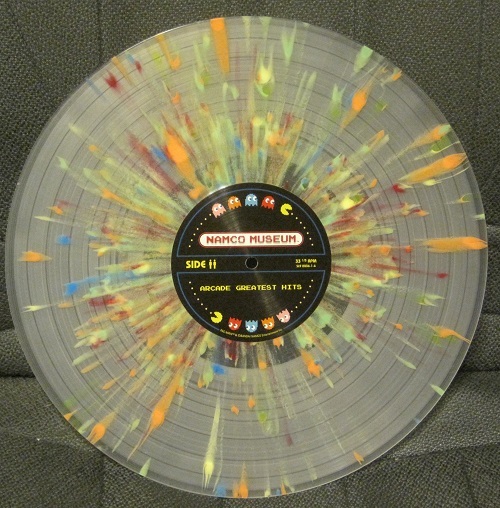 But now you can also get video game soundtracks on vinyl as well. 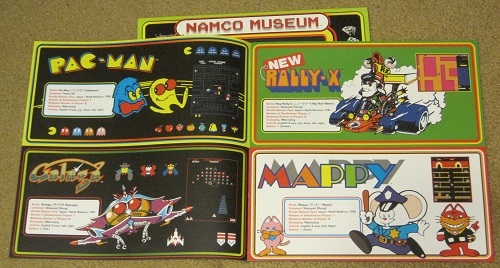 So here’s a review of a Namco Museum record I got this past Christmas! 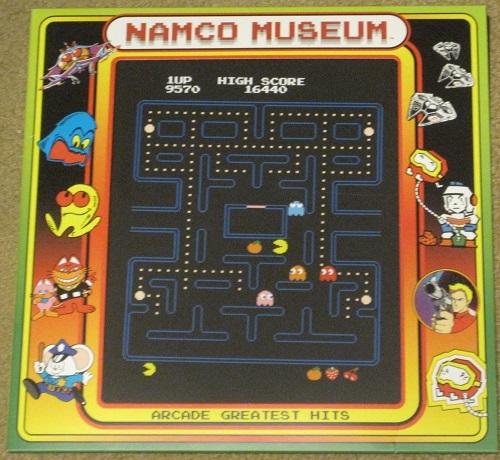 I knew about this Namco Museum record long before Christmas last year, but I didn’t buy it because it was kind of expensive and I knew it was just basically arcade sound effects. I think my family who bought it for me thought it was a new Pac-Man Fever record (I still have my old one from when I was a kid). But I’m glad they got it for me for Christmas anyway because sometimes the best gifts are the ones you want, but wouldn’t buy for yourself. Anyway, here’s a bigger picture of the front of the record case. 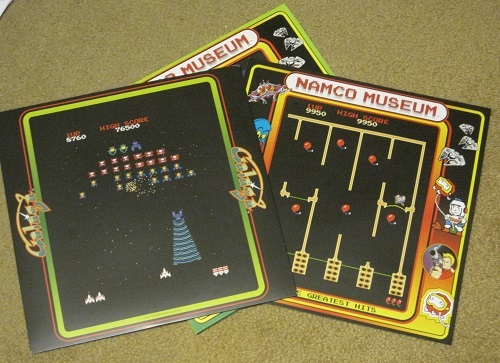 The record has select sound effects and music from classic Namco arcade games from the 80’s. 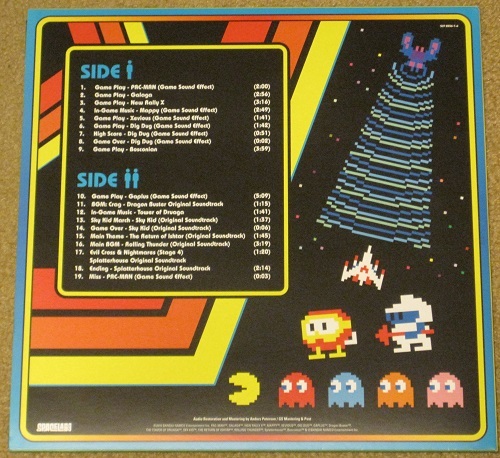 Side One has sounds and music from Pac-Man, Galaga, New Rally X, Mappy, Xevious, Dig Dug, and Bosconian. Side Two has Gaplus (Galaga 3), Dragon Buster, Tower of Druaga, SkyKid, The Return of Ishtar, and Splatterhouse. Here is a shot of the back of the record case. The record case holds two things, a sleeve for the record, and a booklet with info on the games featured on the record. The neat thing is that the outside case has a hole in it, and the back of the case, the record sleeve, and the booklet has screenshots from other games that you can put in instead. So if you don’t want Pac-Man on the front, you can also have Galaga, Mappy, or Dig Dug on the cover. Here’s a shot of all the sleeves and things. And here’s a picture of one of the pages in the booklet. You get artwork and some information on each of the games featured on the record. Last is a picture of the record itself. I think it’s neat how they put artwork on it. Back when I was a kid, I remember most of the records we had were just black. darn that record looks cool!